We managed a cheeky day in the workshop over the bank holiday. It can be summed up in one sentence; we have an antweight arena (well almost)! Chris has been hard at work at making the innovative antweight arena and I can I am impressed with the end product! It is very good to drive on for antweight, and the electrics for the arena were basically completed before Christmas. 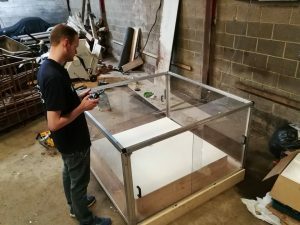 You can see the arena at Antweight World Series 55 on 30th June 2018. On a side note we got a bit further with making Golftank and some bits for the featherweight that must not be named were arranged.